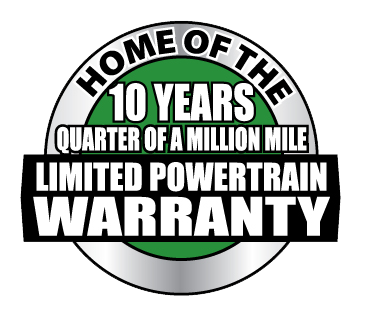 *This (10) ten-year (250,000) quarter million-mile warranty is valid on all vehicles deemed New and the vehicle has never been titled. This is a Limited Powertrain Warranty only. The (250,000) quarter million-mile clause is to be added onto the current number of miles on the New Vehicle at the time of delivery. Example: New Vehicle has 111 miles at time of delivery, then the warranty will expire at 250,111 miles or (10) ten-years, whatever comes first. Please keep in mind that all Factory Recommended Maintenance must be done to keep the warranty valid and we strongly recommend that the maintenance is done at a Murphy Auto Group Dealership, even though it is not required. See Dealer for complete details. 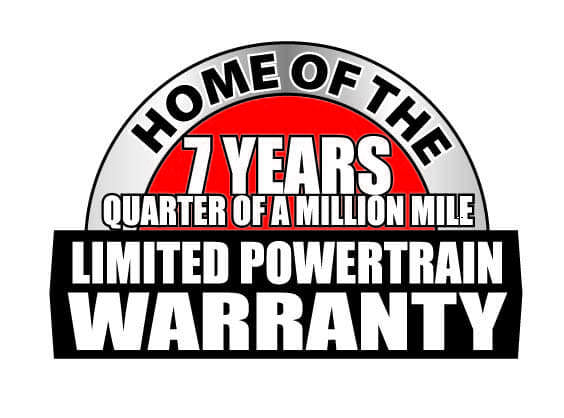 **This (7) seven-year (250,000) quarter million-mile warranty is valid on all Qualified Preowned Vehicles. Qualified Preowned Vehicles are defined as the following: Vehicle must be (10) ten-model years or newer and have less than (100,000) one hundred thousand miles at time of delivery. This is a Limited Powertrain Warranty only. The (250,000) quarter million-mile clause is to be added onto the current number of miles on the Qualified Preowned Vehicle at the time of delivery. 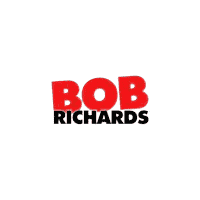 Example: Qualified Preowned Vehicle has 11,111 miles at time of delivery, then the warranty will expire at 261,111 miles or (7) seven-years, whatever comes first. Please keep in mind that all Factory Recommended Maintenance must be done to keep the warranty valid and we strongly recommend that the maintenance is done at a Murphy Auto Group Dealership, even though it is not required. See Dealer for complete details.